Easter is upon us and many churches will fill up to hear the redeeming message of the Cross and of Jesus Christ. It’s usually a beautiful time for a lot of churches to get decked out with decorations and special performances. Not that eternity hinges on the church’s ability to wow their audiences, but the extra added elements usually are a fun experience to be a part of (unless, of course, you’re a kid all dressed up trying to avoid grass stains while searching for plastic eggs). Either way, the message is still the same: God’s grace shattered all logic and made way for the possibility of us kissing eternal death goodbye. One definition of the word “grace”, in the Greek, speaks of a gift or a blessing given to humanity by the Christ. The famous John 3:16 passage tells us that God loved us, so He did something about it. He gave us a gift. God gave us Jesus. And then, the story reveals that Jesus loved us so much that He endured the pain and suffering of the cross. In both instances, God did something about His love for us. Love is always backed by action. With no action, love is non-existent. For those of us who follow Jesus, our lives should be fueled by this love and grace should be evident in our relationships with others. 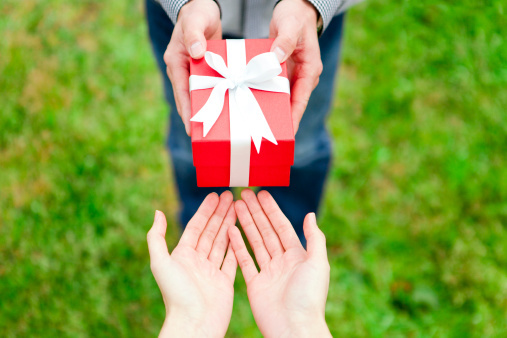 We, as followers of Jesus, should always be looking for opportunities to give a “gift or a blessing” in some way shape or form. In other words, our lives are no longer about us. Our lives, as followers of Jesus, are now about other people. 1. Serve – Humble yourself and find simple ways to serve someone. Ask your mom if she needs help cooking Easter dinner for the tons of relatives who’ll be at her house. Help your dad mow the lawn so that the house is presentable for the tons of relatives who’ll be at their house. Buy breakfast for that homeless person you see every Sunday on your way to church. Serve! 2. Sit – For those planning on attending an Easter service this weekend, offer up your seat to someone else. If you normally attend a church, there’s no doubt that your home church is going to be filled. Take it upon yourself to sit in the overflow area (if you have one) to make way for guests or persons who might need your seat more than you. If you don’t have an overflow area, you can opt for standing instead of sitting in your normal spot to make way for the previous situations mentioned. Sit! 3. Smile – You’ll be surprised at how much of a gift and a blessing smiles can be. Smiles brighten people’s days. They bring a sense of warmth to a conversation. Smiles can offer up peace to heated situations. Studies have actually shown that the simple, natural act of smiling can help our health by lowering our heart rate and relieving our stress levels. Smile! It’s simple. Serve. Sit. Smile. How about you? How can you show grace to someone? Next Post How Did Jesus “Do It”? Years ago, I was reading something by a Danish philosopher/Christian, Soren Kierkegaard. One of his basic statements was that because our God is eternal, He not only expands ever outward, but ever inward. So in the same way, He doesn’t only care for the BIG things we do to show love or obedience, but the LITTLEST things as well. Furthermore, Jesus himself talked about prayer in secret being rewarded by the Father, in front of everyone. These are just the thoughts I had especially regarding #3, to SMILE. That really, really can change someone’s whole day. I’ve had days changed because a stranger was friendly. I had years of my life seem brighter because I was in a thrift store once, and a poor man was whistling jovially. I still think of that seemingly down-on-his-luck man, whistling like the happiest person ever! P.S. Fave part of this post, where you said: “Our lives, as followers of Jesus, are now about other people.” Agreed! Thx for your thoughts. And no worries about the length of your post. I encourage them. The simple less extravagant things are definitely overlooked. And I love this…”He not only expands ever outward, but ever inward.” I love the image of God continually expanding inward in us. It’s a beautiful picture of His unending work in our lives.